Last year, Apple created a new category of computing with the iPad. Now, every other PC manufacturer is rushing to revamp or bring out their own tablet computers. New tablets are expected to dominate at this week’s Consumer Electronics Show in Las Vegas. 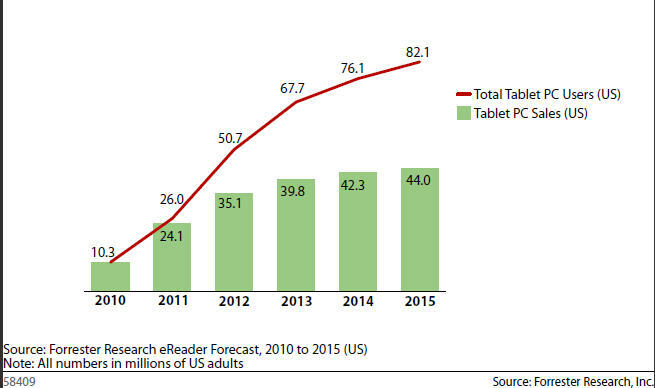 Forrester Research put out a new forecast this morning for the growth of tablet computers. It expects the number of tablets sold in the U.S. to go from 10.3 million last year to 24.1 million in 2011, and growing to 44 million in annual units sold by 2015. At that point, by 2015 it projects that 82 million people in the U.S. will own some sort of tablet, or a full one third of the online population. Apple will still command a “lion’s share” of the market, at least through 2012. I’m sure this forecast will change in six months time (just look at Forrester’s overly-conservative tablet forecast from six months ago), but I do agree that touch computing is with us to stay.